Pure Vanilla Sugar...the finest quality Madagascar Bourbon Pure Vanilla Sugar... a flavorful blend of gourmet baker's sugar & the ultimate of all vanillas, Madagascar Bourbon Pure Vanilla Extract. Pure Vanilla Sugar is a delicious way to add an extra layer of flavor to baked goods such as cookies, pies, & pastries. The rich, mellow flavor of pure vanilla & the sweet crunch of sugar combine to add the essence of vanilla to hot or cold beverages, or as a sweet topping for ice cream, waffles, or cupcakes. With Pure Vanilla Sugar delicious aroma & flavor can easily be added to your morning oatmeal, or sprinkled over seasonal fruits. Use Pure Vanilla Sugar in any foods where a hint of vanilla & the sweetness of sugar are desired. NIELSEN-MASSEY VANILLAS...SINCE 1907!!! 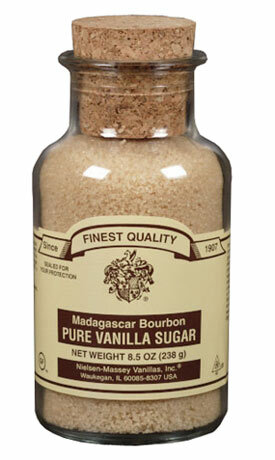 Nielsen-Massey Madagascar Bourbon Pure Vanilla Sugar. Beautiful re-usable cork sealed glass bottle.